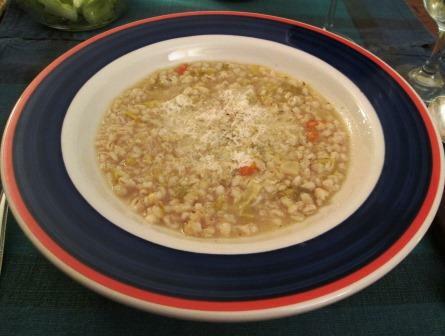 As a first course for my most recent dinner party – on what was predicted to be an extremely cold night – I wanted something warm and savory but not too heavy, to precede a cassoulet: good stick-to-the-ribs fare. I considered a large Alsace onion tart or individual cheese tarts; both very tasty but also things that I make fairly often for dinner guests. 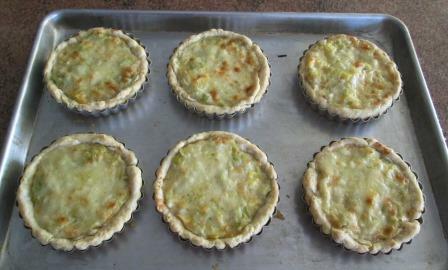 The two concepts coalesced in my brain, with a slight variation: Let’s do individual leek tarts! Leeks are a great winter vegetable, and even though I’d never made or eaten leeks in a tart, I was confident they’d be good that way. 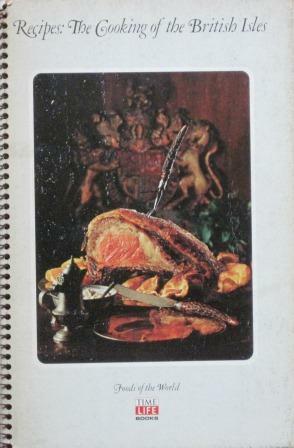 None of my cookbooks had recipes for it, but a little online research produced many, all quite similar. As the main difference among them was the relative proportions of the ingredients, I decided this was a do-it-however-you-like deal. So I did. 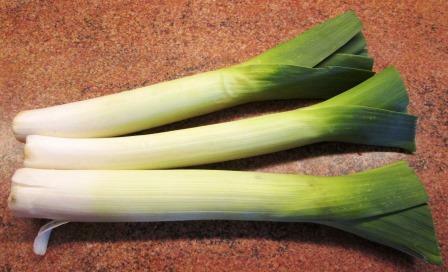 One of my local grocery stores carries excellent big leeks, sold individually rather than prepacked in bunches. I bought three. When Beloved Spouse began cutting them up for me, the white and tender green parts of only two of them filled a four-cup measure, so I stopped him there. 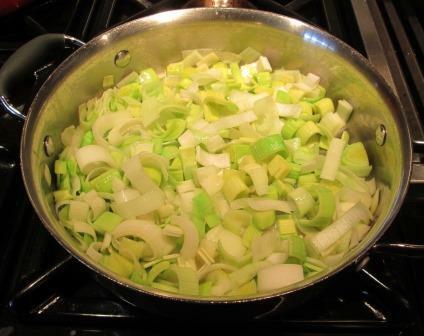 (No problem about the extra: leeks never go to waste in my kitchen.) 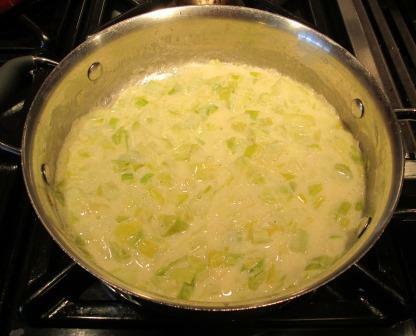 I melted butter and olive oil in a sauté pan and cooked the leeks gently until they were just tender. At that point the online recipes variously said to add either heavy cream, light cream, or half-and-half, as well as grated gruyère. Instead I stirred in a cup of mascarpone. When it had fully melted and smoothed out, I added half a cup of gruyère, and the tart filling was ready. 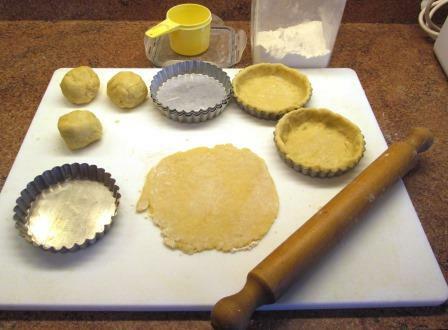 For my pastry shells I used a pâte brisée recipe from Simone Beck’s Simca’s Cuisine. I like it because the dough is made with a whole egg and white wine, which give it a little flavor boost. Three-ounce balls of dough are just the right amount for my 4½-inch fluted tart pans. After filling the shells with the leek mixture I distributed another half cup of gruyère over their tops and baked them at 375° for 30 minutes. They were just beginning to brown when I took them out of the oven. 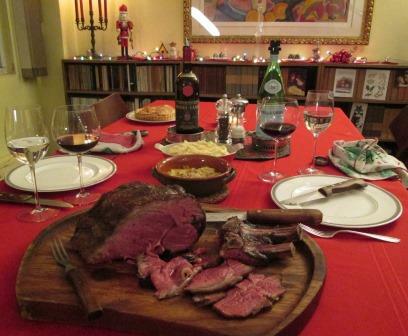 All this was done the day before the dinner party. Cooled and covered, the tarts sat overnight in a cold room. At dinner time the next day I put them under the broiler for ten minutes to complete the browning. Alas, I can’t show you the final result. In the bustle of serving the meal I purely forgot to take a photo of the tarts. But they were a great success, and the guests loved them. The vegetal brightness of the leeks, the lush creaminess of the mascarpone, and the warm, buttery crunch of the pastry played off each other beautifully. If those little tarts had a fault, it was more richness than was perhaps advisable for diners about to tackle a cassoulet – but we all finished them anyway! 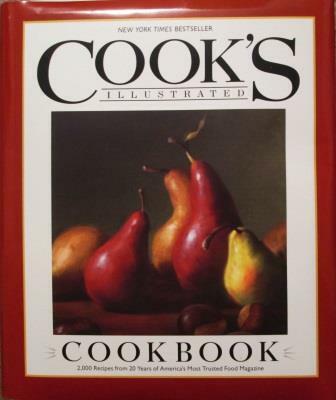 When I was growing up, my mother never cooked cauliflower. What we knew of it, we didn’t like. When I’d encountered it at other people’s homes, it was boiled long enough to bring out the sulfur smell and was drenched with a sauce of Velveeta cheese. It took many years for me to realize cauliflower didn’t have to be like that. 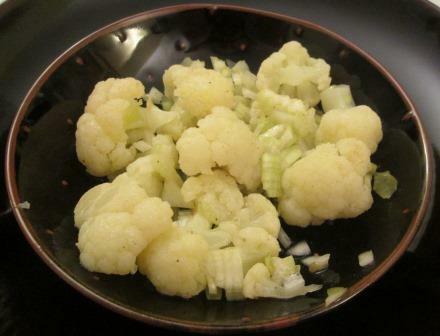 It was when I started doing some Indian cooking, and discovered the many interesting ways that cuisine uses cauliflower, that I became curious about the vegetable. I now know that, when not overcooked, it has a wonderful ability to bond with all kinds of other flavors. I still don’t serve it often, because an average-sized whole cauliflower is a lot for a two-person household to get through. But I do choose it occasionally. Here are the simple ways I dealt with the head that I brought home this week. 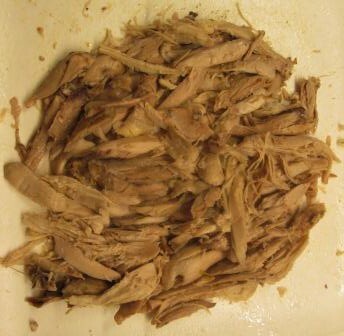 I took about a third of the florets off the head, steamed them for seven minutes, until they were just tender. 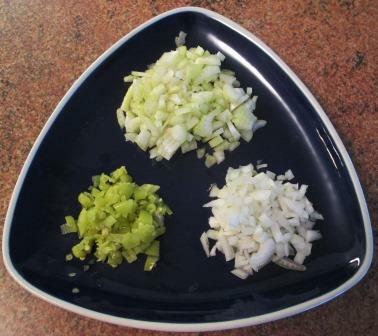 I also chopped ½ cup of celery, ¼ cup of onion, and ⅛ cup of Tuscan pickled peppers. While the florets were still warm, I tossed them gently in a bowl with the chopped vegetables, extra-virgin olive oil, my own wine vinegar, salt, and pepper. I had to be careful with the vinegar because my Tuscan peppers were very strongly pickled. The mixture made a pleasant, light vegetable starter for a weekday dinner. In spring or summer, I also add a few thinly sliced radishes and some of their tiny leaves to this salad; but I never buy radishes in November. 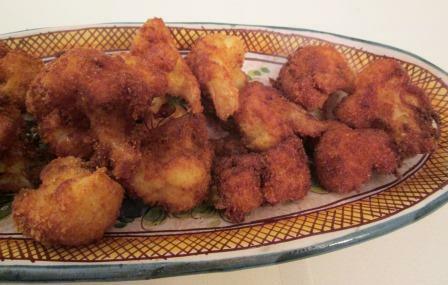 In principle, I follow Marcella Hazan’s recipe for breaded and fried cauliflower, though it’s such an easy process that it hardly needs a recipe. 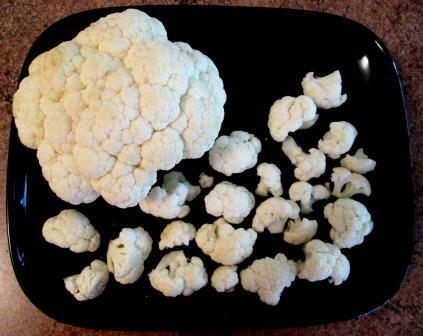 This evening I took off half the remaining florets from my head of cauliflower, steamed them for only five minutes (since they’d be getting more cooking later), and let them cool. I dipped them first in an egg beaten with salt, then in dry breadcrumbs. Beloved Spouse then stepped up and fried them for me, in half an inch of very hot olive oil. It took only about a minute on each side for them to turn richly golden. 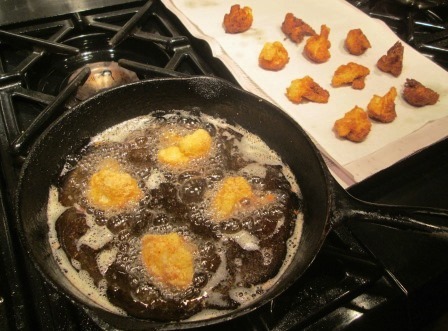 While the steaming and breading can be done an hour or more in advance, once the florets are fried, they need to be eaten right away to be at their best. This time they were, as always, crisp, crunchy, and delicious – an excellent accompaniment to broiled lamb chops. Actually, they would work well with almost any un-sauced meat or fowl. 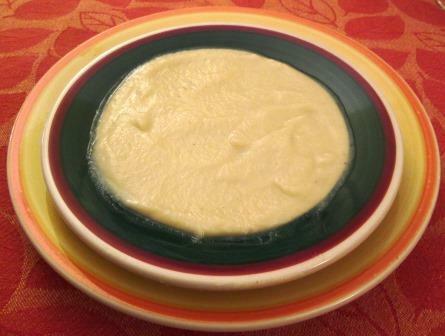 I dedicated the rest of my cauliflower to a favorite soup. 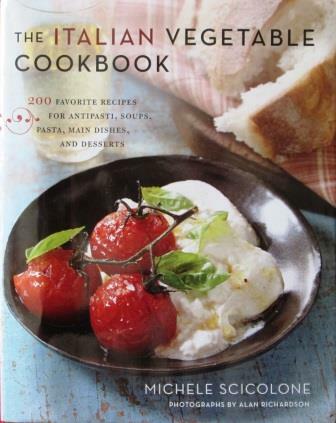 The original recipe is from Alfred Portale’s Twelve Seasons Cookbook. 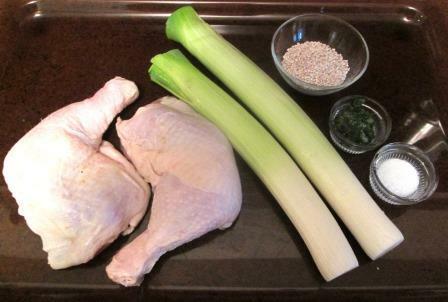 There it’s called a vichyssoise, to be served cold. 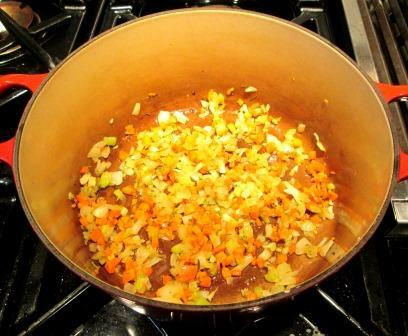 I make just the basic soup, leaving out several of the recipe’s garnishes, and I like to serve it hot. 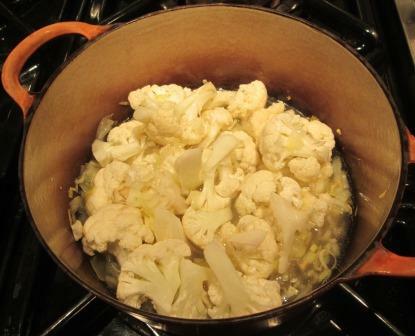 To make a small enough soup for the amount of cauliflower florets I had left this week, I chopped ¼ cup of onions and thinly sliced ⅓ cup of leeks. 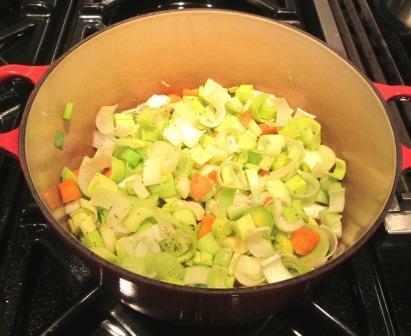 I sauteed those two vegetables in a tablespoon of olive oil, then added the florets and a cup of chicken broth from a bouillon cube. 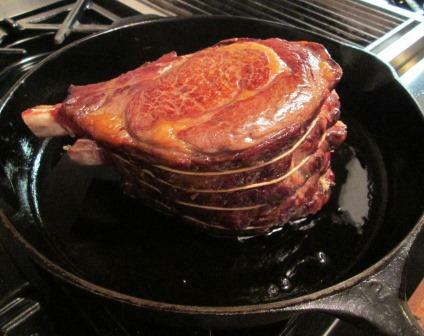 This cooked, covered, for 20 minutes, until the florets were tender. Then I pureed everything in a blender. 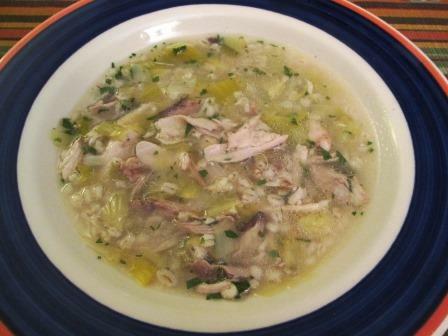 I tasted and added salt and pepper, and the soup was ready to reheat at dinner time. 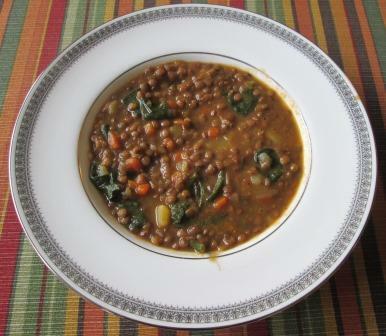 This simple soup is just amazingly good. 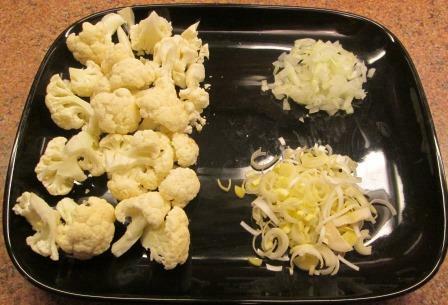 In a blind tasting, you probably wouldn’t guess it was cauliflower; you’d distinguish only a generic vegetal sweetness. And it’s such a rich puree you’d think it must be at least half butter and cream. I’m sure the dressed-up version – with sauteed cauliflower slices, a dose of olive oil, and a sprinkling of chopped chives – would be excellent too, but I’ve never felt the need to try it. 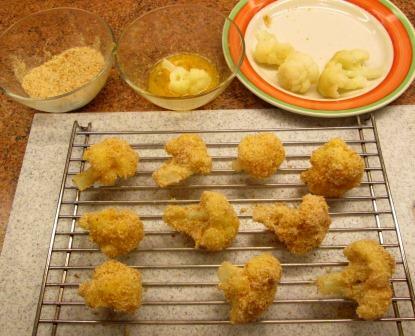 There’s nothing complex in these cauliflower dishes, especially compared to those in typical Indian recipes, but each is very tasty, and together they show the versatility of the vegetable I once disliked. We live and learn, eh?